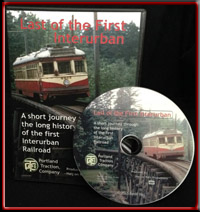 explores the history of the first Interurban Railroad in the United States, written and narrated by Al’s son David Haij, owner of Haij on Rails Productions. Share Als love of railroading by revisiting his legacy with Dave, who spent many a day traveling to photograph key railroading events as a boy. This first DVD, explores Als love of electric and interurban railroads and trolley systems, but Al was a fan of all railroading and his lens captured rare steam and diesel railroading history as well. Look for future product releases exploring Al’s collection in both large format prints and video.